At about 5:10 am, we hear the familiar knocks on our thin metal door. Yes, it was Doctor Dipak waking us up to come out of our rooms and enjoy serene scenery of the mountains before sunrise. Worst than the previous night, Kamlesh and I stayed up almost all night bundled up in our layers sipping flavored electrolyte charged water with lights on. Even after sleeping with 3 layers of clothing topped with a thick blanket, I still didn’t feel warm throughout the night. In between, I dozed off for a few minutes here and there, but that’s pretty much it. We get out of our rooms, which were on the outside wing, a few steps below one of the local in-town trails. Climbing 7 to 10 steps to reach to the trail level to get an unobstructed view of the surrounding mountain was a task. I am telling you, at this altitude, every uphill step takes a toll on your body. As usual, the early morning blue sky was relatively clear with scattered clouds and towering mountains.I put on my jacket and grab my camera to snap some shots before sunrise. It was freezing cold. I can see a thin layer of ice on the metal roof of the hotel and a sink outside my room used by the hotel dwellers to hand wash clothes. After climbing 7 difficult steps, the following is the first view of the day. Brightly colored Buddhist stupa at the entrance of the town before sunrise. As I wrote earlier, the views before and after sunrise are totally different. During my early days of learning photography (I am still learning..), my photography guru used to extend both of his arms to the shoulder level and tell us that the best time to photograph is when the sun is below the extended arms. Early morning view of Dingboche with two Buddhist stupas and snow-covered mountains. The snow-covered mountains were glowing in early morning sun while rest of the valley was still dark. The scenery was so beautiful I quickly forgot the pain of climbing the first seven steps in the morning and within no time I was hiking on a small trail above our hotel. 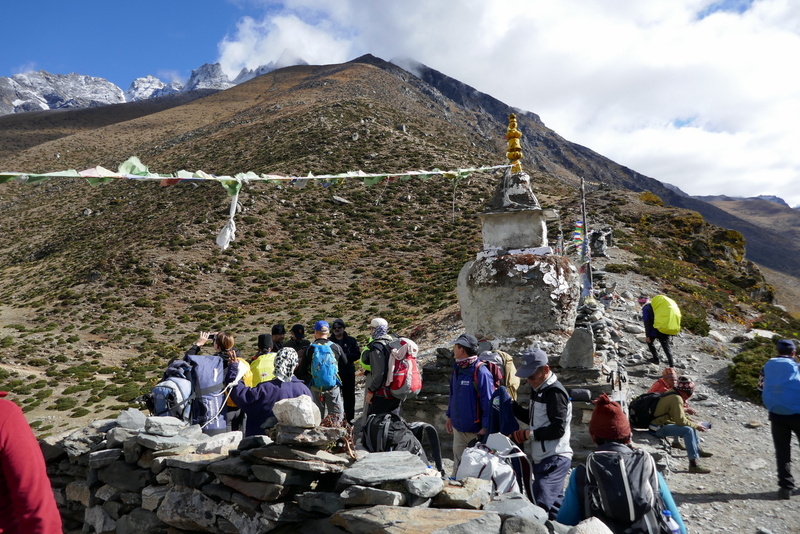 There are two buddhist stupa as you enter Dingboche (see picture above). The one on a hill is the at a higher elevation and provided a beautiful silhouette view against the sunlit mountains. These photos are one of my favorites from the trail. A hiker watching sunrise from Buddhist stupa at Dingboche. Here is a panoramic view of Dingboche village from my early morning photo hike (click for a larger image). The light blue and green colored roofs were looking harmonious with the surrounding. Rush was brave enough to hike up to a small hill with stupa (see upper right corner of the image above) and photographed unobstructed views of the mountains, see below. Snow covered mountains at Sunrise, Dingboche. As you know, there are no “rest” days on the EBC trek – they are actually acclimatization days where you “hike higher and sleep lower”. We are going to hike to Nagarjuna peak. Now, there is some confusion about the name of this peak. 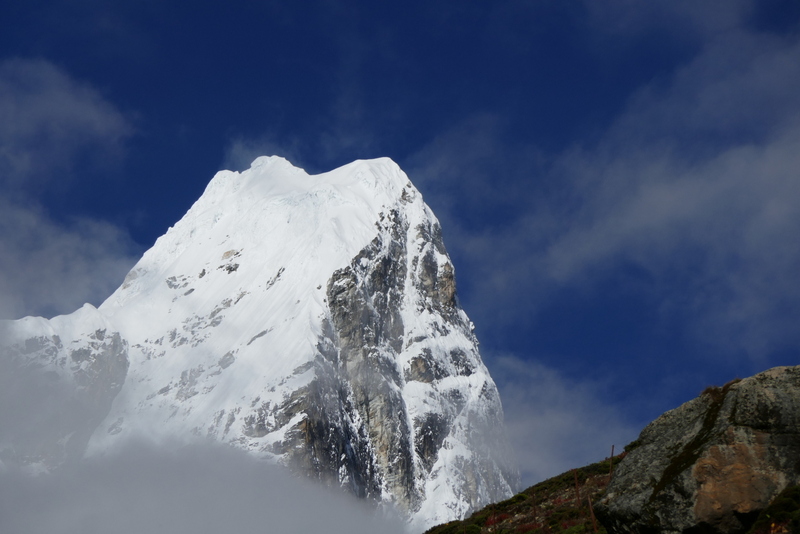 Our guides called it Nagarjuna peak but I have also read Nangkartshang Peak, or Nangkar Tshang, or Nagarjoong, etc. in various guidebooks and blogs. Whatever is the name, one thing is sure – it is a spectacular destination through a very difficult hike. All three rules of mountaineering quoted at the top of this page undoubtedly apply to this hike. Anyway, after a very rewarding early morning photography hike, I am ready for a cup of hot tea and some snacks so I can take my daily dose of Diamox. When I went to the dinning room, it was all empty – a worker was cleaning the floor! I realized it was too early for a tea so I came back to my room and took some photos of the room and hotel. Generally, when I am traveling abroad I take plenty of photos the food I eat and the places I stay. While writing this blog, I realized that I didn’t do it this time because I only had one camera battery (remember, I forgot my camera case in helicopter) and when I am at a hotel it is charging at the front desk (along with my iPhone) so not too many pictures of food or my messy room. Panoramic view of my room at Goodluck Hotel, Dingboche. 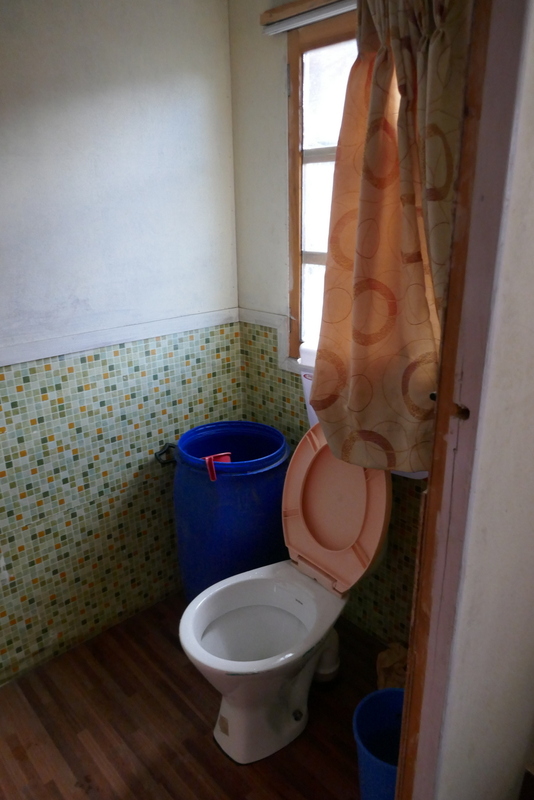 Attached toilet, Goodluck Hotel, Dingboche. 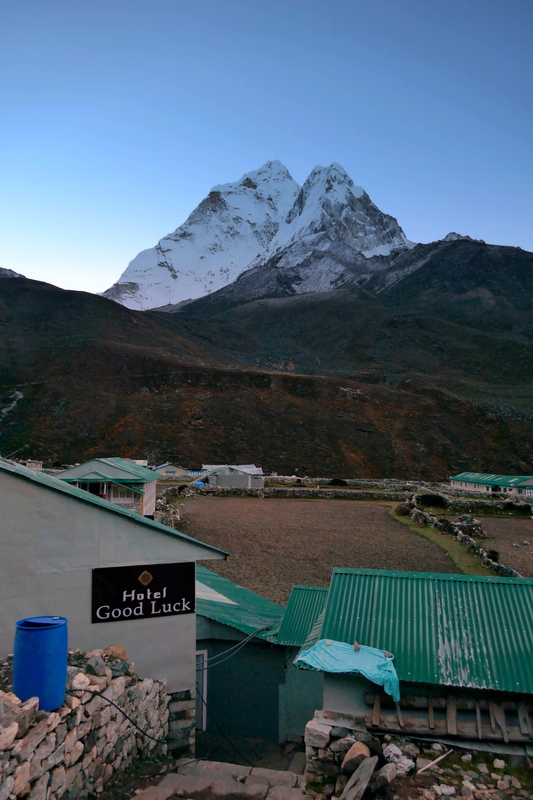 We stayed at Goodluck Hotel in Dingboche and it was very nice (relative to this region). Our room was, relative to this region, very nice. It was carpeted, had attached toilet (a luxury on EBC trek), an LED lamp, mirror, small side table, and operating window with curtains. Almost all the hotels we stayed during the EBC trek had one thing in common, the bed were narrow and short. If you are above 6 feet, you may be sleeping with your feet dangling from the bed. The hotel provided blankets were thick and clean, pillows were OK. I used my inflatable pillow on top of hotel pillow almost every night. The attached toilet had laminated floor, a large plastic barrel full with ice-cold water and a small plastic tumbler. There is no water tank or flush mechanism at hotels on this trail. You use water from the plastic barrel with a small plastic tumbler to flush after your use. Even with all this trouble, having an attached toilet saves a lot of hassel to get out in the middle of the night with a flash light to use the facility. Our room (left) with a laundry sink outside. The hotel had four common use sinks outside the dinning room and one laundry sink directly across my room. 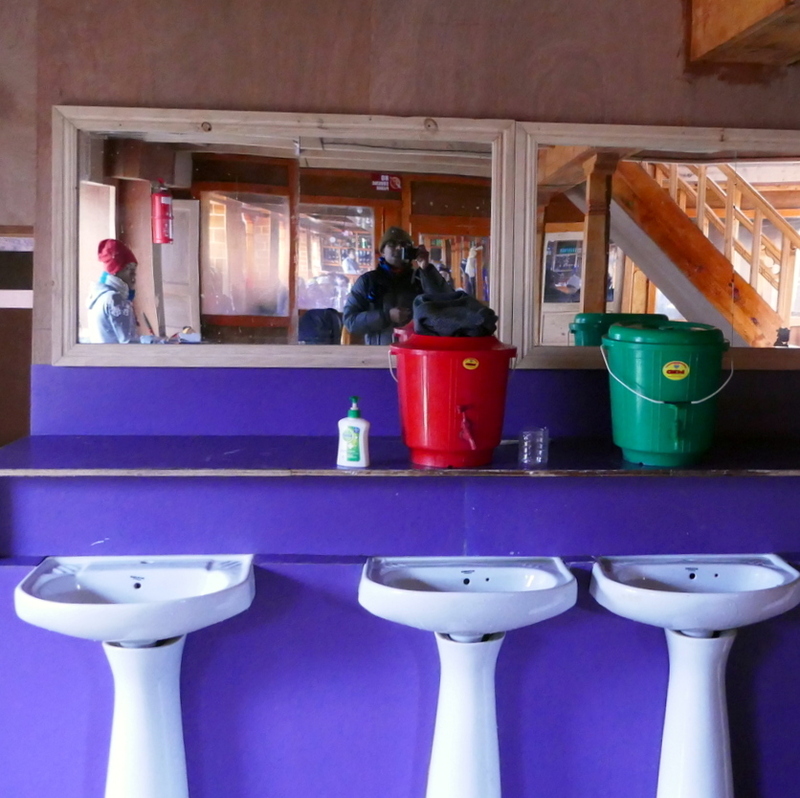 These hotels don’t have any built-in plumbing – the water is supplied by buckets with a tap set above the sink. This set up here was perhaps the best and cleanest compared to other teahouses we stayed on the EBC trek. 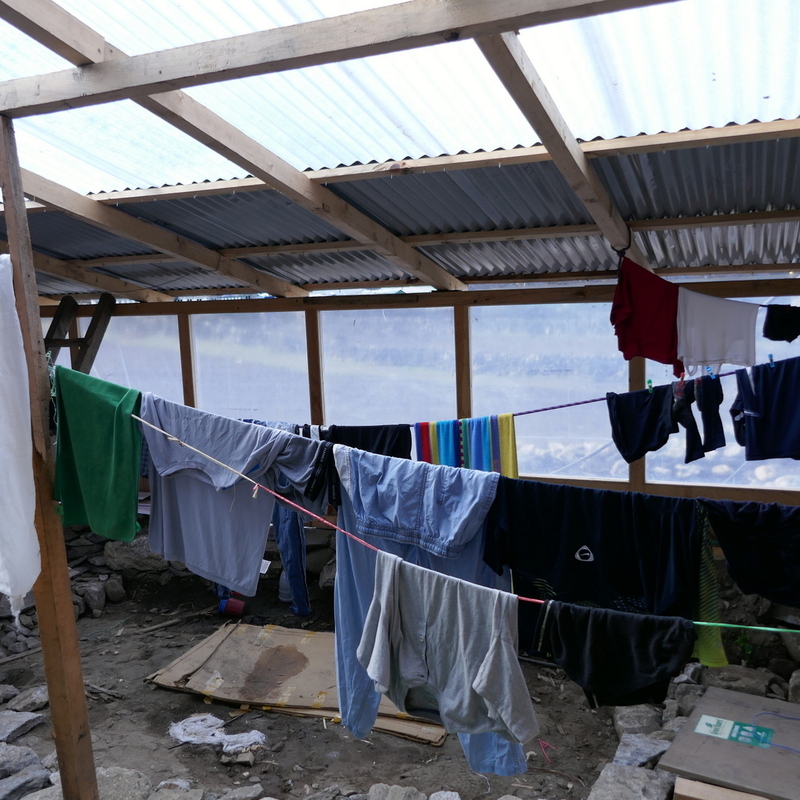 Across these sinks – there was an enclosed area (looked like under construction of renovation) used for drying clothes. I hand-washed a couple of items and it too over two days to partially dry. The shower arrangement at this hotel was very interesting.The shower room had about 4X4 feet plastic shower pan with an overhead instant heater run by the LPG (Liquid Petroleum Gas – see my write up from Day 2) cylinder that was outside the shower room. An attendant will stay outside the shower room and when you are ready to take the shower, you knock on the outside wall of the shower room so he will open the valve on the LPG cylinder which will start the instant heater. When you are done, you knock again so he can turn off the valve. When I went to take the shower, the water was not hot enough so I asked him how to fix it. Before I realize, he was knocking the shower door and wanted to come inside (while I was shivering in my birthday suite!) to adjust the settings on the heater. Seems like whoever took shower before me had changed it. After he tweaked the settings I get reasonably warm water to finish my shower. Our guide Deepak came with breakfast menu to take our orders in advance. While waiting for the breakfast to be ready, we tidied up our room a little bit and got organized for the day’s hike. Now that it’s getting colder day by day, I carried my down vest and thick gloves with liners for the initial part of the hike. After a while, you warm up enough and start shading the layers. After breakfast we leave for our hike around 7:05 am. The sun was out but it was cloudy so the mountains were playing hide and seek. We take the same trail we came from yesterday for about 25 minutes until we reach a Buddhist stupa where we take a break with other hikers to enjoy the scenery and take photos. 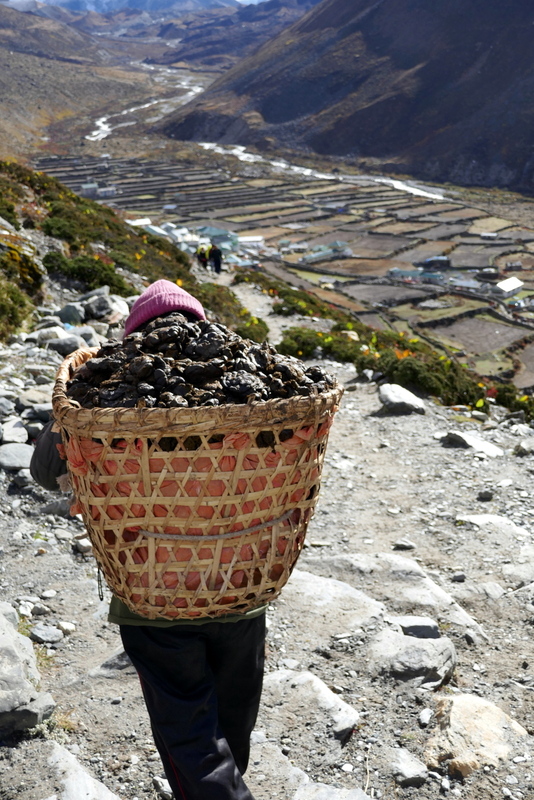 Along the way we see Yaks going up the hill and yak dung going down to the valley to use as fuel. It’s a closed loop recycling system here in the valley. Nothing is wasted! 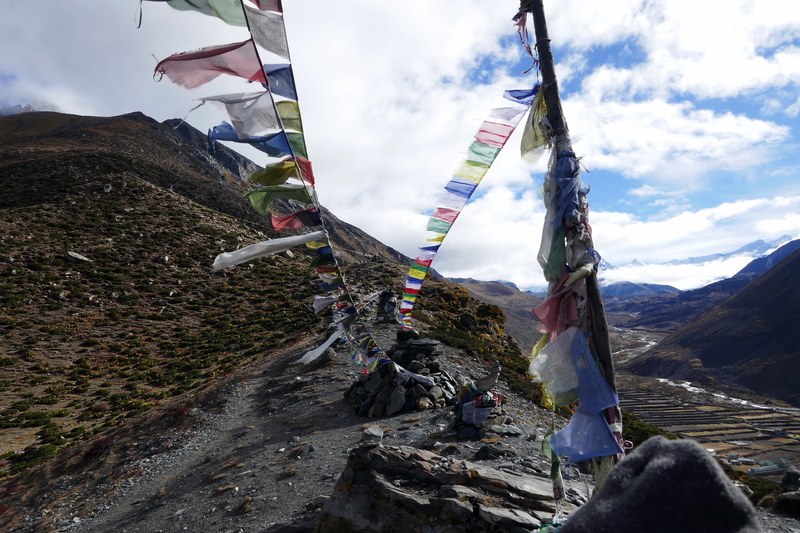 From the Buddhist stupa rest point, the trail splits; one go along the mountain ridge steep uphill toward the Nagarjuna summit (along the prayer flags – see image below) and the other goes towards Lobuche (our next stop tomorrow). It’s a natural gathering place for the hikers and porters to rest before continuing the hike. By now the sun was out and it felt good to spend some time in the sun warming up and watching the interplay of sunlight and shadows on the mountains and valley (see above). Here is a panoramic view of the same area, once again clicked by Varun on Samsung Note 7. 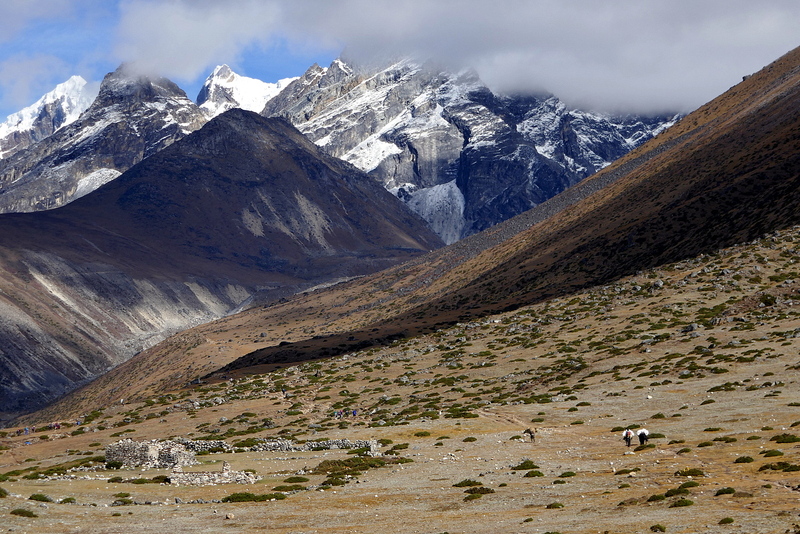 Panoramic view of the Dingboche valley. The rest stop is on extreme right side. Click for a larger image. From here we climb along the mountain ridge with Dingboche valley to our right. The climb from here was getting progressively steep and we were stopping after a few steps to rest. 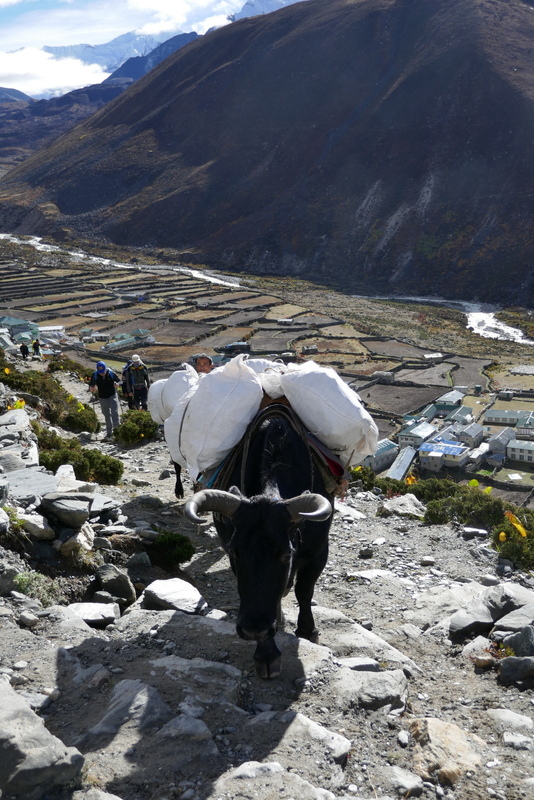 The climb to Nagarjuna was the steepest I had encountered so far – including the infamous Namche Hill and the Hotel Everest View. Even with my usual icebreaker merino wool base layer, Patagonia R1 fleece mid layer, and North Face Nuptse down jacket on top I was still feeling cold. After about 30 minutes, I was warm enough so removed the down jacket (which neatly packs into a manageable size sack). In about 20 minutes, we reach at relatively flat top of the first smaller hill and rest for a while. From here, you can see entire Dingboche valley, Imja Khola river, and a massive rock slide that looks like a glacier. The stacked rocks provided interesting foreground for the morning sun and Ama Dablam mountains so we took many photos while resting. Here are some of my favorite pictures. Dont forget to check out my photo-album at the end of this page for more pictures! I had invested in buying an expensive pair of gloves with techno liner that supposed to work on touch LCD of my camera and iPhone but it was not working half the time. Every time I took my gloves out to change the settings on my camera my fingers became momentarily numb but the scenery was so spectacular, I ignored it and kept clicking. After about 20 minutes in the hike, there is another rest stop with lots of prayer flags on the way. From the next rest stop, we see a long stretch of Prayer flags connecting between top and bottom stupa. 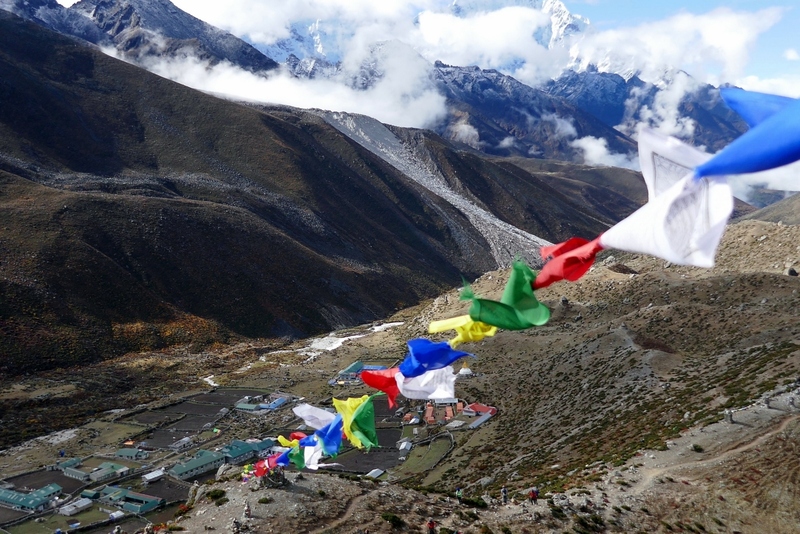 Prayer flags with Ama Dablam in background. We were lucky that the first hour and half of our hike the sun was out so it was not too bad. The view of Imja Valley and Dingboche in full sunlight was beautiful from here. As we climb higher, it progressively got colder and the biting cold wind got nastier.I recall reading somewhere that the temperature drops 1 degree Centigrade at every 100 meter elevation gain – not sure if its accurate. Pheriche Valley with Tabuche and Cholatse peaks behind clouds. 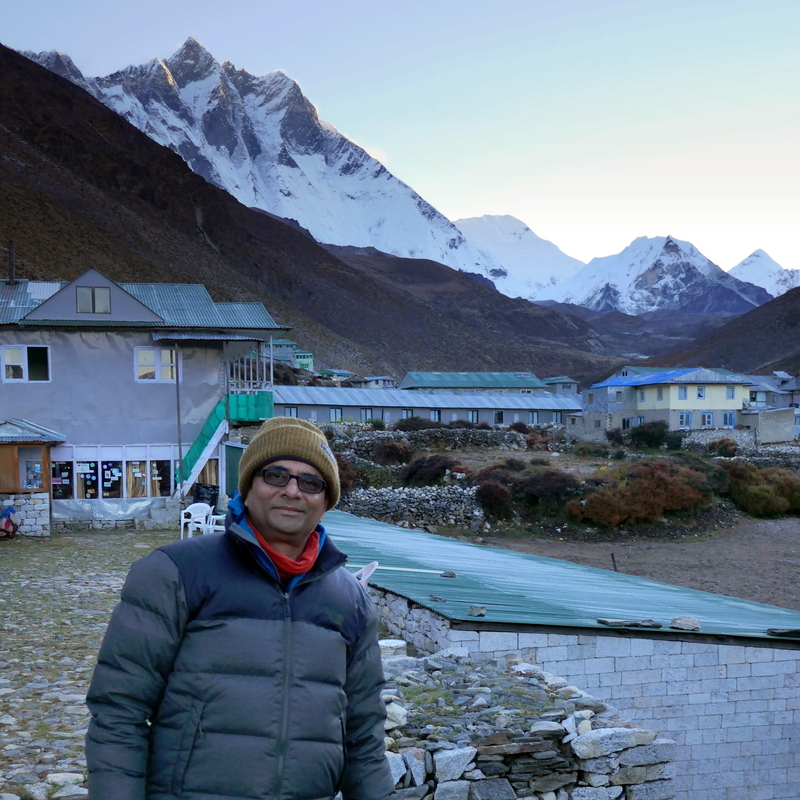 Dr. Dipak took a break meditating across the Ama Dablam mountain at the rest stop. One of my favorite pictures of him. EBC trail up to Tengboche was moist enough (perhaps because it rained a few times) I didn’t feel any issues with trail dust. After that, I felt there was noticeable amount of dust (both from soil and dried yak dung) that I was using my woolen buff to cover my nose most of the time. 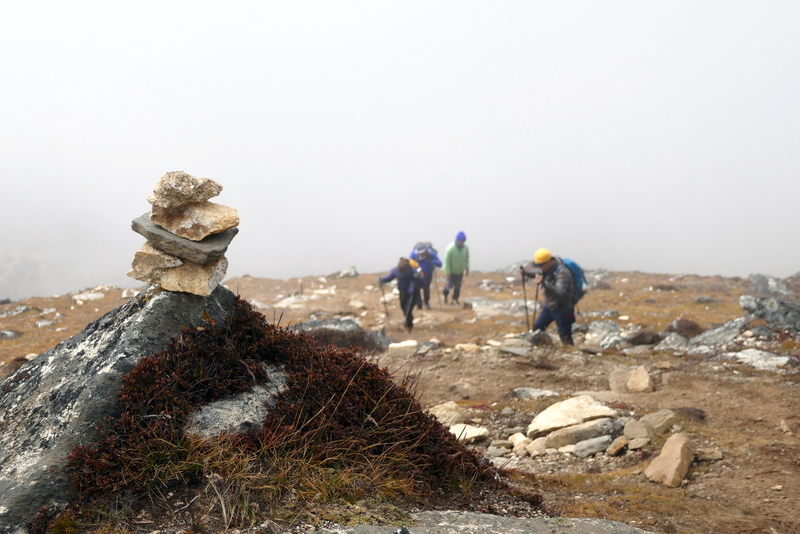 Of all the gears I used throughout the EBC trek, two were most helpful – buff and hiking poles. I carried two buffs, two regular synthetic stretchable and the other merino wool longer version. I would highly recommend taking these two as you can layer them up in extreme cold while hiking or sleeping. The biggest issue with buff over my nose was it fogged up my prescription glasses so I had to frequently remove it to clear up the fog. Even with this inconvenience, it was well worth it. Dust induced cough (“Khumbu Cough” as they say it on the trek) is so common on the EBC trek that majority of the people who trek during October/November season suffer from it at some point of the trek.Often times, the wind carried trail dust created by the hikers before you right at your face on steep incline so it is better to keep some safe distance if you are hiking in a group. Steep hike towards Nagarjuna peak. (c)SherpaValley. Kamlesh and Tshering on a steep incline. The hike after our last rest stop is all uphill on a very steep incline. 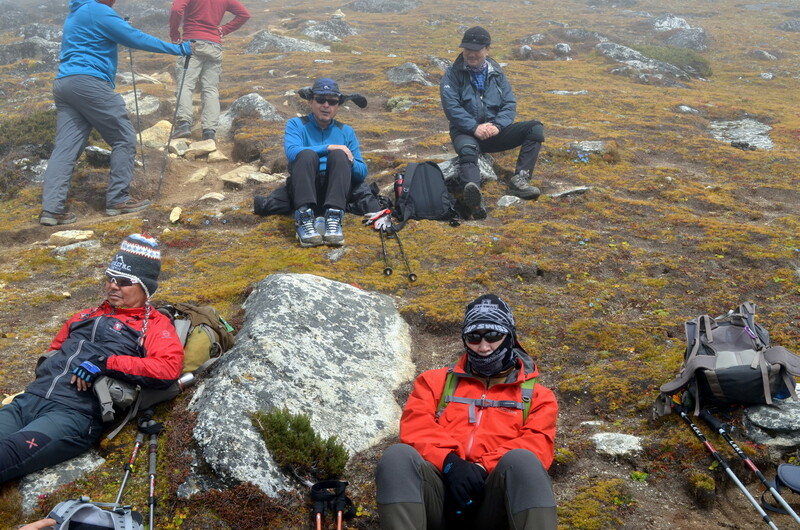 The picture above shows disappearing Dingboche town on upper left corner and our group hiking up on a steep incline. One of the limitations of two-dimensional photographs is that it compresses a large area into a small rectangular frame that does not accurately portray the vastness of the area and steep mountain sides. 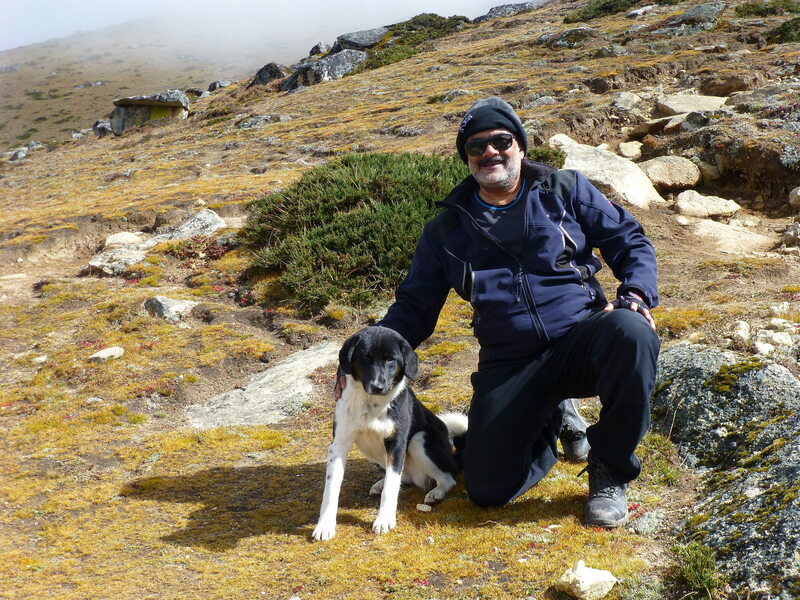 Along the way, Dr. Dipak made a new friend and Manubhai ran into an old friend. Low atmospheric oxygen at higher altitude combined with cold and wind made hiking challenging at times. Hiking on the extreme steep incline at the upper half of the trek, my mantra was four to five steps up and rest. Closer to the summit it reduced to 2 steps up and rest. At first I thought I was terribly out of shape but after looking around, I found others were more or less following the same routine. Tshering kept reminding me Bistari Bistari – slow and steady – in Nepalese. Seeing him running going up and down (he kept checking with others in our group) made me feel like I am from a different planet. In our group, Doctor Dipak, Rush, Varun, and our guide Deepak were significantly ahead of us (me, Kamlesh, Manubhai and Tshering). Initially, we were able to see them but as we climbed higher, the fog and rolling clouds made them invisible. The last one hour hike was very strenuous. By now, I have stopped asking Tshering “how far it is” question as it doesn’t matter anymore. I learned not to look for the summit (or final destination) but just keep going, resting, photographing, and most importantly thinking. here is a small video clip from the hike. You will be surprised how much time you have on this trek to think about everything that matters to you. The EBC trek was one of the two most challenging, yet rewarding, things I have done in my life. The second was a 10 day Vipassana meditation in Northern California. While hiking to the Nagarjuna, I was drawing parallels to both experiences. First, you are on a forced “digital detox” program. There are no distracting emails, phone calls, or other modern communication means. Second, you are solely focused on one object throughout the day. Third, there is less and less communication (Vipassana is 100% silent meditation for 10 days). Initial part of the EBC trek, we talked a lot but as we hike to the higher altitude, there is not time (or energy) to talk as I was frequently out of breath. Besides, there is not much to talk. As we pass each other on the hike, we made eye contact and a node to make sure all is well and keep going. Lastly, in both experiences, we eat and slept less. In Vipassana, we only eat till mid day and fasted till next day breakfast. Interestingly enough, it was more or less the case during the EBC trek as Diamox (or altitude) killed my appetite and I was eating much less as we got closer to the base camp. (I eat almost nothing for the last 24 hours at Gorakshep, read more here..) So, out of 24 hours, I hiked 6 to 8 hours and perhaps slept 2-3 hours (if at all) leaving several hours to think. When you are detached from your familiar surroundings and all the usual distractions, you have plenty of time to focus, think, and reflect about your life and what matters the most. I consider hiking in wilderness as a form of meditation, something that feels more natural than my usual meditation practice that has a feel of an “engineered” approach. In my understanding, the conventional meditation approach is to completely block (or extremely limit) all sensory inputs (the five senses: sight, sound, smell, taste, and touch) to your mind so your monkey mind can focus without such sensory distractions. Serene scenery, clean fresh air, quiet environment, and intimate experience of nature in Himalaya clears all the unwanted clutter in your mind and helps you realize the things that matters the most to you. Perhaps, this is why spending extended period of time in Himalayan Mountains has been a norm in several eastern spiritual practices. OK, off my soapbox and back to the reality on ground. As we got closer to the last lag of the summit, I see Doctor and other members of our team coming down. I had made myself a promise not to ask “how far is it question” but without me asking they said it’s about 30 to 45 minutes to the summit. What? Another 30 to 45 minutes? I was surprised, as it looked so close during momentary openings in constantly rolling fog at the summit. Well, the first rule of mountaineering (see quote at the top) at it’s best –let’s keep going. A 74 years old Korean hiker was very inspiring. Finally, we (Kamlesh, Manubhai, and I) made it to the summit around noon, in about four and half hours with all our rest and photography breaks. The last few meters before the summit were very difficult and I was on “two steps and rest” schedule. Also, there is not clear path, you negotiate your way through the scattered rocks. 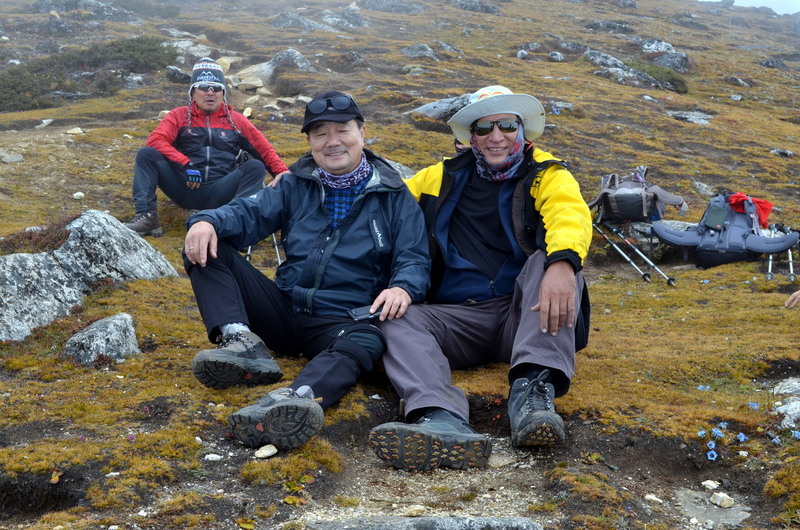 Tshering, Manubhai and Kamlesh arriving at the summit. Our other team (Doctor, Varun, and Rush) was already on their way back, we met them about an hour ago on their return trek. 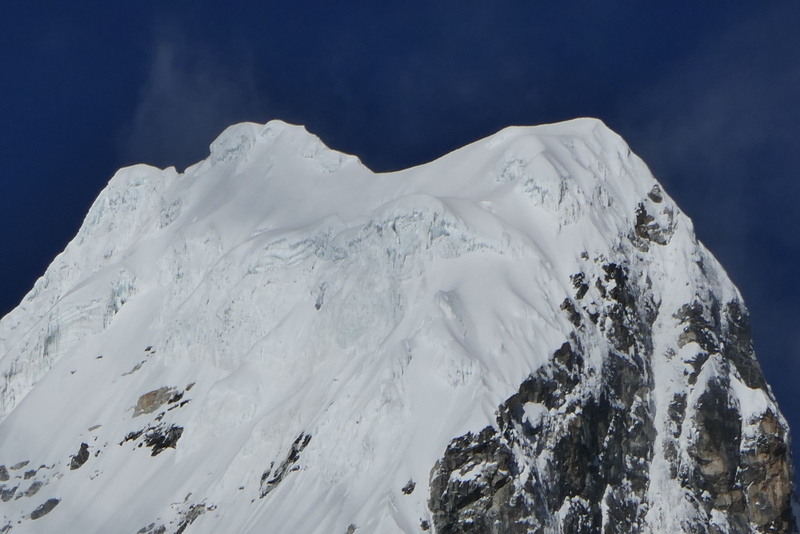 We explored around the summit and took lots of photos.Just beyond the peak, the ridge turns into a sharp edge with an almost vertical side going down several hundred meters making it difficult and dangerous to go up to the edge. Nagarjuna Summit with almost vertical side. There are beautiful views of Pheriche valley and several alpine lakes with emerald blue water from the summit. Unfortunately, I did not write down the names of these lakes. If you know it, please let me know. View of a small lake and Ama Dablam from Nagarjuna acclimatization hike. Following a famous quote by Ed Viesturs, “Getting to the top is optional. Getting down is mandatory” we start heading back to our hotel. People often think gravity does all the work and it’s kind of reward for the long and challenging ascent. In reality, steep downhill is also difficult on your knees and there is a real danger of slipping on dirt trails. I use hiking poles which takes some pressure away from my knees and so far it has worked well for me. It takes some practice to use the poles correctly though. Some people from my group borrowed my poles and found them to be useful so Doctor Dipak went out shopping for them after we arrived at the hotel around 2 pm. To my surprise, he found a nice, genuine looking, pair of used Leki Hiking Poles at a reasonable price in Dingboche. I spent rest of the day in my room trying to catch up with my sleep. Tomorrow, we hike to Lobuche.